Beyond The Legend Goes Live! 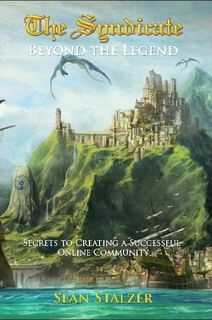 In May of 2011, our second book, Beyond The Legend went live. Responding to feedback on what readers wanted to have seen in our first book, our second book is described as: Continue on a fascinating journey through the history of online gaming as seen through the eyes of The Syndicate, one of the oldest and most successful player organizations in the history of gaming. Learn the secrets to creating, maintaining and growing your own stable online community. More than fifteen years of Syndicate experience are boiled down into a formula for success that you can apply to your guild. Time tested methodologies and lessons are shared to help you create success for yourself and your friends. Look into the future of MMORPGs. The key to the future success of online gaming is meeting an ever changing set of player expectations. We explore those expectations and how developers can and should meet them in the years ahead. The successful games of the future will be the ones nimble enough to meet those expectations. With Foreword's by Curt Schilling (who described the book as: "In this book you will hear from someone who as 'done it.' Sean's been there and done that for well over a decade...") and John Smedley (who described the book as: "This book does a great job explaining the things that make The Syndicate work and how to take those lessons and apply them to making your own guild. "), Beyond The Legend is a great read and contains content that is valuable, insightful and entertaining to read. You can pick up at copy at LULU.COM or at Amazon.com among other places.